Leica’s Q compact camera has been given a functionality boost with a firmware update that adds the option to shoot Raw-only, and extends the longest shutter speed from 30 seconds to 120 seconds. Firmware version 2.0 makes a number of changes to the way the full-frame 24MP camera operates adding some new features and fixing issues that made handling difficult in some cases. The AF system functionality has been changed to allow different sized AF selection areas, while at the same time correcting an ability to focus on subjects outside the picture area when shooting in the cropped modes. Face detection also now reverts to multi-area AF when no face is detected in the scene. A useful new feature automatically switches the camera to use the rear LCD to display image review and menu navigation when the EVF is being used – for viewfinder photographers who prefer to see their images and menus in a larger format. Additionally, now user profiles can be accessed via the rather under-utilized Function button. 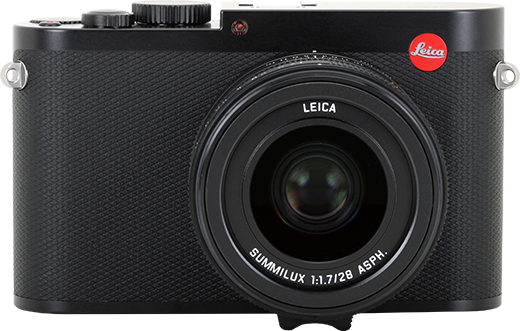 Leica Q owners can download the new firmware via the Leica website. An optimised EVF mode makes navigation even easier than before. With this firmware update, a press of the Menu or Play button now allows the user to switch straight to menu control / picture assessment on the LCD screen. The shutter speed range has been expanded and now includes speeds of up to 120 seconds. The spirit level display has also been improved, remaining visible when the shutter release is pressed. The 1-field autofocus metering area can now be selected in three different sizes: small, medium and large. AF motion in digital zoom mode for focal lengths of 35mm and 50mm has been limited to avoid focusing on objects outside the zoom range. Face Detection has also been optimised: if no face is detected, AF now automatically reverts to multi-field autofocus mode. Other new additions include a countdown display for long exposures / noise reduction, three modes available for the thumbwheel (Off/Auto/Exp. Comp.) and deactivation (Mode Lock) of the video button, if required. A change to WiFi password setting now allows the characters to remain visible when entered, and flash-unit compatibility has been extended to support the Leica SF 40 and SF 64.